I have first encountered Windfaerer with their 2-track demo Glorybound a few years ago and remember liking their take on melodic black/death metal with a touch of authentic folk melodies. 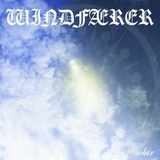 Having missed the full-length which came afterwards, I am back to Windfaerer now, when they are still searching for their destiny with another self-released EP named Solar. An outlet for the musical aspirations of the mainman/vocalist/guitarist/bassist Michael Goncalves, Windfaerer is probably translated something like “traveler on the wind”, and with Solar the band journeys a lot, spanning quite a few of melodic extreme metal influences. It is if they are taking the Island of New Jersey, USA, where they are from, and moving it into the middle of North Sea, to catch the gales which would come in equal measure from Scandinavia, British Isles, and maybe even a whiff or two from France. Beginning to build the ominous wall of guitars on the short instrumental opener The Mortal Flare, A Glimpse of Light comes out with a full-on double bass rush with the blast being turned on subsequently. Almost flaunting melodic riffs in your face A Glimpse of Light could fit on a latter day Immortal or Lord Belial, but the textured sound invokes Wodensthrone. In a touch of experimentation, A Glimpse of Light also has some of Alcest euphoria, only it is a lot more ill-omened in its feel. Michael Goncalves is proud of his Spanish origins, so maybe my geography placing of Windfaerer is somewhat off, but many of the cuts on Solar could fit Scandinavian blueprint just as much as they can be at home on the Iberian peninsula with their well-defined prideful melodic riffs (Worlds of the Self, In the Shadows of Giants, The Morning Star). If Worlds of Self and The Morning Star bring on more of the personal struggle feeling, In the Shadows of Giants, title befitting, begins with a strong thundering doomy march. Perhaps it is because Michael pours a lot of his soul into Windfaerer, or maybe it is because black metal sung with a Latin accent requires it, some of the vocals on Solar appear overly vomitous, reminding me of a now-defunct Mexican band Buried Dreams (see their epic track Gods of Fire on the album Perceptions for reference and compare it with Windfaerer on Worlds of the Self). My two favorite tracks on Solar are the epic Blackened Voids and another short instrumental flamenco inspired A Moura Encantada. Blackened Voids goes from intense blasting black metal in its verse to an almost happy melody chorus, to die suddenly into an acoustic interlude, after which a violin completely takes over. The instrument is simply tremendous in this song, growing strong and most muscular you would ever hear a violin sound. A Moura Encantada is a welcome respite and decompression afterwards. With a plenty of talent and ideas in its kegs Windfaerer deserves your attention. Not sure if it is by design that the band continues on in the self-releasing mode, but if it is the lack of label support I have heard a ton worse signed to a number of underground labels proliferating melodic black metal. There is certain originality to Windfaerer sound, and definitely a lot of dedication from its members.